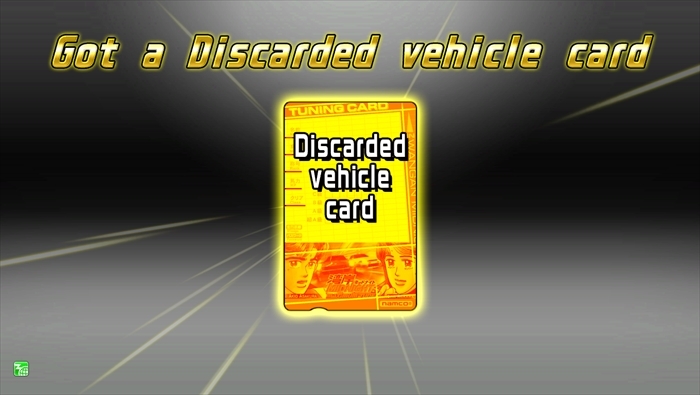 What is a Discarded Vehicle Card? 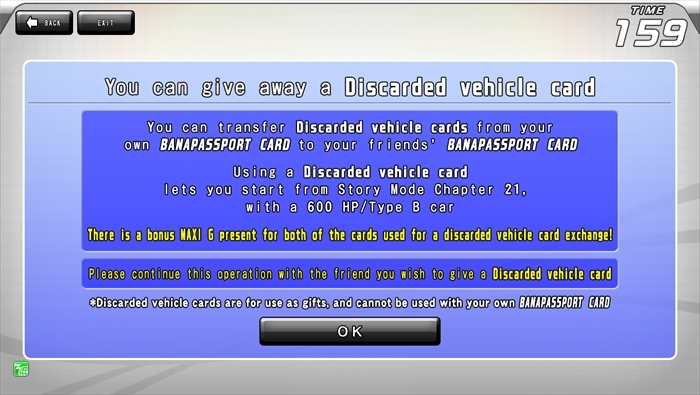 The Discarded Vehicle Card is a system for registering cars that can start the game "from Episode 21 in Story Mode" or "from a 600 HP/B class car" on your friend's BANAPASSPORT Cards. 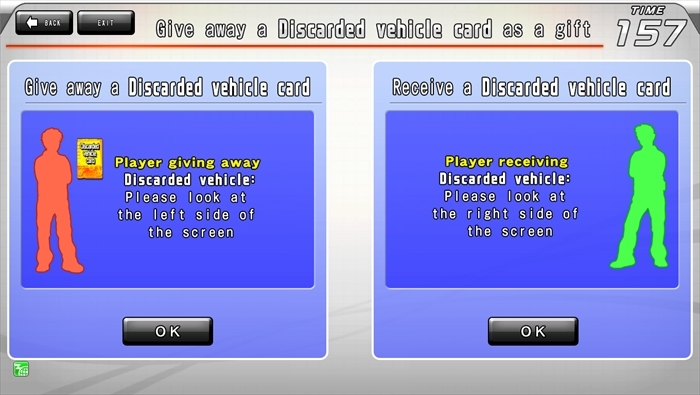 "Discarded Vehicle Cards" can only be used as gifts for friends. You can earn one Discarded Vehicle Card by playing 60 times with a car registered on your BANAPASSPORT Card. 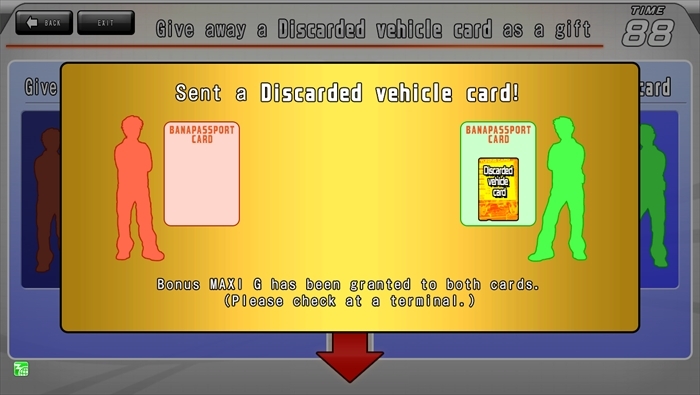 Earn up to 5 Discarded Vehicle Cards on one BANAPASSPORT Card. 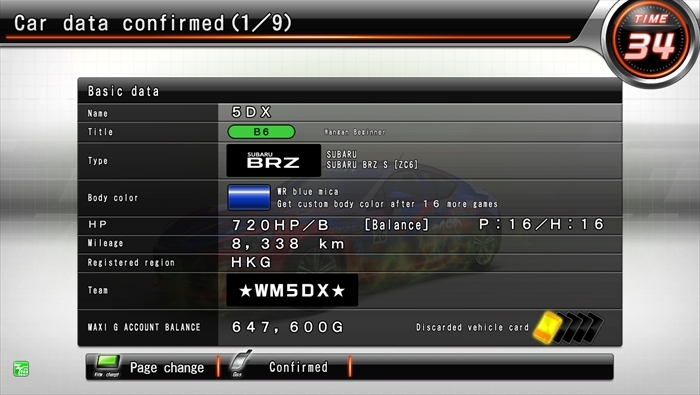 Earned Discarded Vehicle Cards are displayed on the first page of the Car Data Confirmation screen. 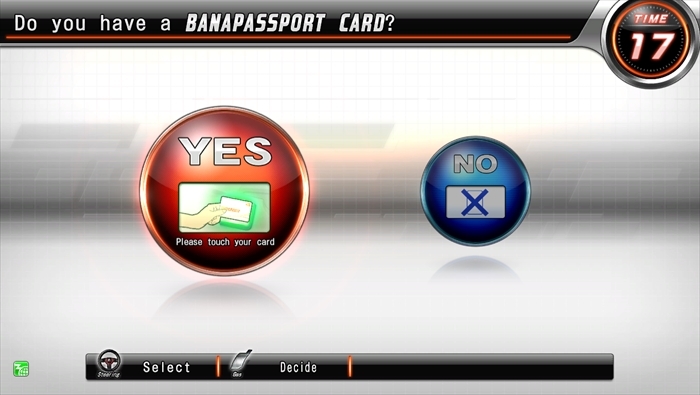 1.Touch the Wangan Terminal screen to begin using the Wangan Terminal. Press your Banapasspot Card to the card reader. 2.An explanation for the Discarded Vehicle Card system will be displayed. Touch "OK" or "YES" if you've read it and don't have any problems. See the explanation for gifting on the left side, and for receiving on the right side of the screen. 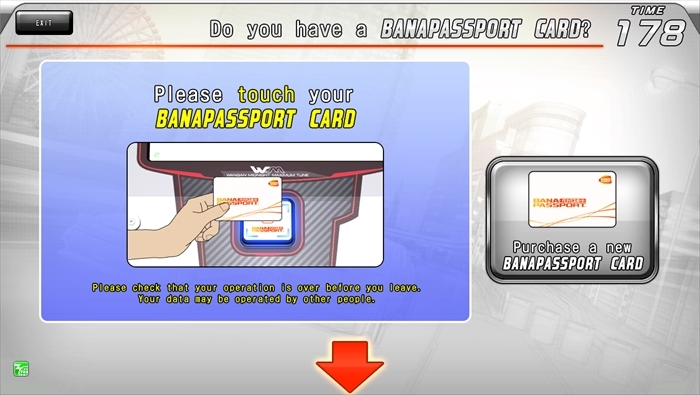 3.Press your friend's BANAPASSPORT Card to the card reader. 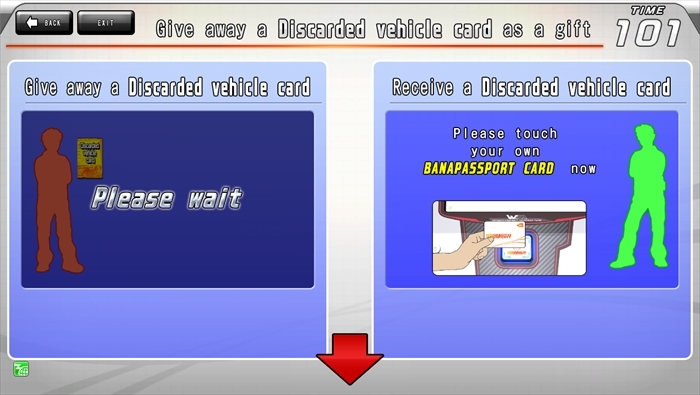 4.Gifting the Discarded Vehicle Card is complete if the following screen is displayed. *You can't gift a Discarded Vehicle Card to a BANAPASSPORT Card that already contains Discarded Vehicle Card data. 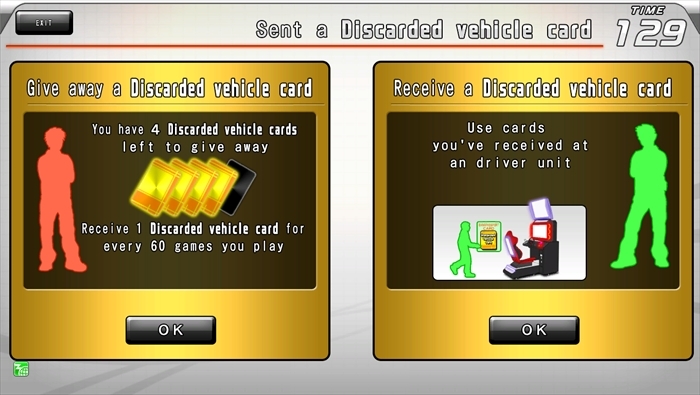 However, if your friend has a Discarded Vehicle Card that they earned from the arcade driver unit, they can receive another one as a gift. *You can't gift to a BANAPASSPORT Card that has 100 cars registered. 1.Insert a coin in the arcade driver unit and press the BANAPASSPORT Card that received a Discarded Vehicle Card on the card reader. 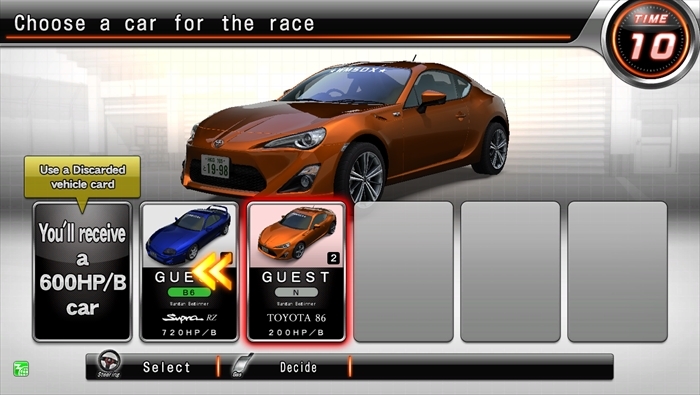 2.A notification that you can use the Discarded Vehicle Card will be displayed.「The selection on the farthest left side of the screen, "Select a car to use in a race," will become "Register a 600 HP/B class car". 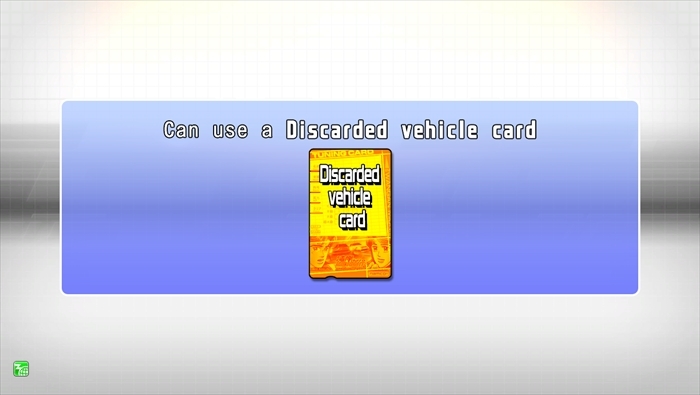 Select this option to use the Discarded Vehicle Card. *If you select an already registered car here, the received Discarded Vehicle Card won't be deleted. The following types of cars can be registered on the BANAPASSPORT Card when using a Discarded Vehicle Card. ・Tuning　→　600 HP/B (Power 10/Handling 10) The name and body color will be registered the same as a normal car. *The following types of cars can be registered on the BANAPASSPORT Card when choosing some models. The Discarded Vehicle Card can be used as follows. You have a friend who hasn't played Wangan Maxi. You want to race together in Wangan Maxi, but all the cars you own are cars that have been highly tuned so your friend can't compete. 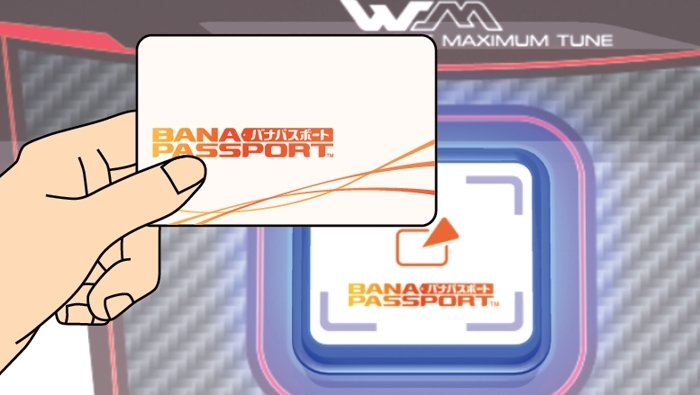 →In that kind of situation, gift a Discarded Vehicle Card to your friend's BANAPASSPORT Card. You'll enjoy an equally close race if your friend registers a 600 HP/B class car to race. →In that kind of a situation, trade Discarded Vehicle Card with friend. Both you and your friend can try a tuned car that you're interested in.